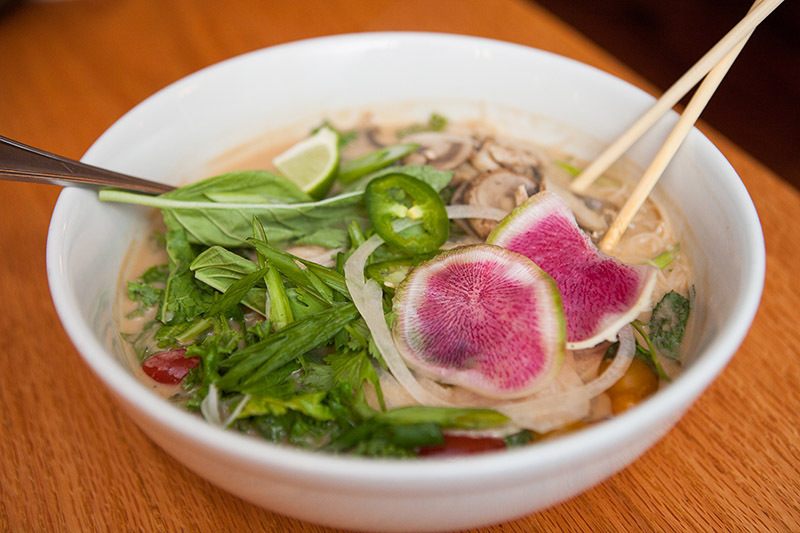 Isola brings back Pho Night and it’s delicious. 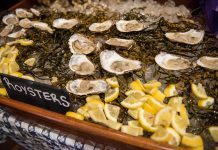 My favorite thing about dining on Martha’s Vineyard is the unlikely combination of factors and circumstances that produce great food. Never in my wildest food fantasies would I peg an Italian restaurant as making an amazing bowl of pho (say it with me: FUH). The staple of Italian cuisine is pasta, which comes in many shapes and sizes that determine how it’s served. The same goes for Vietnamese cooking, which uses a vermicelli-style rice noodle in the cuisine’s iconic soup. So it’s not too much of a stretch to connect the dots, and the spectacular final picture is Pho Night at Isola in Edgartown. For those of you who are still scratching your head, pho is a Vietnamese noodle soup that is as tantalizing as it is addicting. The base of the soup is a rich broth flavored with cinnamon, cloves, star anise, and cardamom, swimming with vermicelli rice noodles, topped with cilantro, basil, onion, jalapenos, and scallions. Isola offers a chicken, beef ball, and vegetarian pho. The veggie bowl is also vegan, and features a lime and coconut broth. All three flavors cost $20 each. For those who are super hungry, you can get a “super bowl” for $5 more. The good food news doesn’t stop there, however. The well-rounded menu features five appetizers, two cold noodle options, ramen, and a hot fried chicken dinner. For those who aren’t ready to jump into the deep end of the pho pool, the kitchen can still make ravioli, spaghetti and meatballs, and pizza slices. But I would be doing you a disservice if I didn’t tell you to order off the special menu, which is bursting with refreshing flavor. 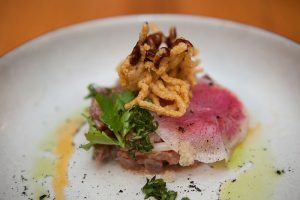 Yellowfin Tuna Tartare, topped with cilantro, basil, and fried noodles. 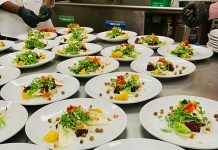 ($16) with basil and nduja sausage in coconut milk broth, or start off with the Yuzu Caesar Salad ($13) for a delightful spin on Isola’s classic salad. 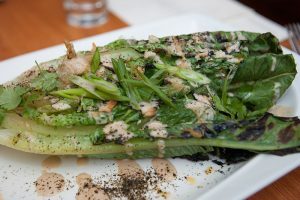 A head of Romaine lettuce is grilled and topped with a tangy and acidic yuzu dressing, cilantro, dusted with nori, and finished with bonito flakes. “Look at how they’re still moving,” Chef Jimmy Alvarado points at the bonito as he puts the plate on the table. The Yellowfin Tuna Tartare ($16) is another standout appetizer. The raw fish is served with cilantro, basil, a miso sauce, and topped with fried noodles. The dish is refreshing and spicy with a satisfying crunch. When it comes to the main event (your bowl of soup), you can’t go wrong with the chicken or beef ball. Each option is delicious and filling, and the beef balls are out-of-this-world good. They offer a crunchy texture that is a welcome pairing with the soft rice noodles. 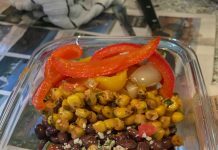 For the vegetarians or vegans, the vegetarian bowl is a delicious alternative. Packed with a variety of fresh vegetables like broccoli rabe, grape tomatoes, and mushrooms, it’s definitely on par with its meat equivalents. The Yuzu Caesar Salad is a twist on an Isola classic, and features nori, bonito flakes, and green onions. fresh basil, candied nuts, a chili garlic sauce, and spicy pork sausage. The bowl is bursting with flavor, and the spicy pork sausage is definitely the highlight of the dish. The soba noodles have an intriguing combination of miso and lychee vinaigrette, topped with cilantro and nori dust. Whether you come for a drink and linger to try some appetizers or make a three-course meal, Pho Night at Isola has something for everybody. Isola is located at 19 Church St. in Edgartown, and is open Thursday through Monday, 5:30 to 9:30 pm. Pho Night is every Monday through the winter. 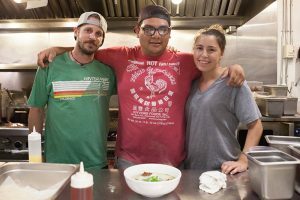 Isola’s kitchen crew, from left, Nicholi Sullo, Chef Jimmy Alvarado, and Victoria Daley.